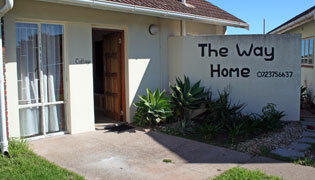 Cape Town West Coast Accommodation - Accommodation on Cape Town's West Coast at The Way Home, affordable West Coast Accommodation in Cape Town. The Way Home is a private residence which has been converted to provide West Coast Cape Town accommodation for self-catering guests but also offers Bed and breakfast. There are 2 fully furnished self-catering units each with its own private entrance. There is plenty of safe off street parking inside the yard. All the rooms are on ground level and wheelchair friendly. Vredenburg is the business center of the West Coast, which is well known for the annual flower season which usually arrives six weeks after the first winter rains. The cottage has a separate bedroom with a double bed & cupboard. The living area has a double bed, a single bed & also a double sleeper couch. The shower & toilet are in a separate room. The Pension has a double sleeper couch in the living area. The very large bedroom has a double and 2 single beds. The shower and toilet are off the bedroom through the doors of the closet. "Thank-you Joy and Mike for a wonderful stay, delicious breakfast & interesting conversation"
"always nice to stay here Food Excellent & everyone always friendly"
Cape Town West Coast Accommodation - Find & Book Accommodation on Cape Town's West Coast, in Vredenburg/Paternoster, at The Way Home, affordable West Coast Accommodation in Cape Town.